An intriguing shape with rich traditional styling, the Pacific Campaign Accent Table from Royal Kahala is sure to add warmth and sophistication to any area in your home. Crafted from select hardwoods with ribbon stripe and quartered mahogany veneers, the Pacific Campaign Accent Table features classic, rounded bun feet and brass accents on the eight corners of the octagonal table that add a visually pleasing pop against the rich dark coffee Kona finish. The accent table includes one door with one shelf behind, providing you with the perfect place to store reading glasses, remote controls, and any other items that need a place to be tidily tucked away. Cozy the Pacific Campaign Accent Table up to your favorite seat in the house, adding traditional warmth and eye-catching interest to your décor. 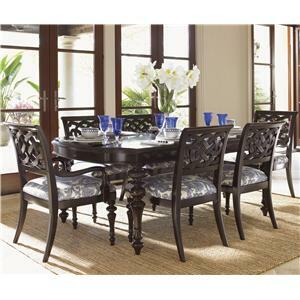 The Royal Kahala Octagonal Pacific Campaign Accent Table with One Door & One Shelf by Tommy Bahama Home at Hudson's Furniture in the Tampa, St Petersburg, Orlando, Ormond Beach & Sarasota Florida area. Product availability may vary. Contact us for the most current availability on this product.